"You are a liar, Quon. You are a good liar, but a liar nonetheless." TIM-22 is right, of course: Dr. Quon's entire career has been built upon one key deceit. "Robots never lied before you created the TIM series... before you gave robotkind the upgrades that made us more human and more like you." Dr. Quon's stellar success followed his creation of the companion machines called TIM, each resembling an angelic human boy. 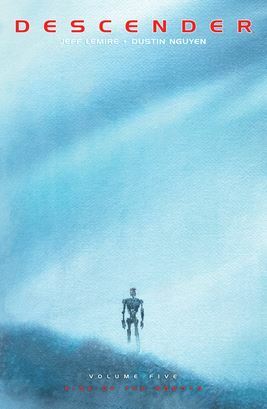 It was a huge advance in robotics which he claimed as his own, but he stole the technology; and when the celestial, planet-sized Harvesters arrived ten years ago to wipe out vast swathes of organic life and so catalyse a war on all robots, it was discovered that they bore the same machine codex - the robotic DNA - of the TIMs. This is the penultimate volume. Please see previous reviews of DESCENDER for more. The watercolours on the inside are every bit as beautiful as the covers.